Kindness grows when children are provided opportunities to understand others. Parents have the ability to teach children how to consider the experiences of others and care for one another. Through empathy, children receive the building blocks for relating to and connecting with others. Don't shy away from conversations about diversity. When your children spend time with people whose identities may be different from their own, teach them to ask questions and show interest in the lived experiences of others. When spending time with your little ones, show them what kindness and emotional connection look like. Children become what they observe. Model acts of empathy for them. For example, after meeting a friend at the park, say to your child, "Our friend was so happy to see us and we were happy, too! And we were all sad that she couldn't stay longer." Sometimes giving voice to your own feelings helps children to understand their own. Verbal exchanges only account for a portion of communication between people, but nonverbal body language allows us to understand information more fully. Practice being fully engaged during conversations with your child. Show facial expressions and use reflective listening techniques to help them feel understood. For example, if your child says, "I don't want broccoli, I want candy! ", a parent would say, "You want me to know that you do not want broccoli but would prefer to have candy." The parent does not give up on the healthy meal, but has helped the child feel understood by acknowledging his or her feelings. Strive to find joy in all the moments of parenting, and help your children sense that same joy. One suggested kindness exercise involves perspective sharing: mindfully take a moment to understand a situation through the eyes of your child. Now, invite your child to see the world from your perspective. Share what you learned with each other to foster self-awareness, social awareness, and kindness in your child. 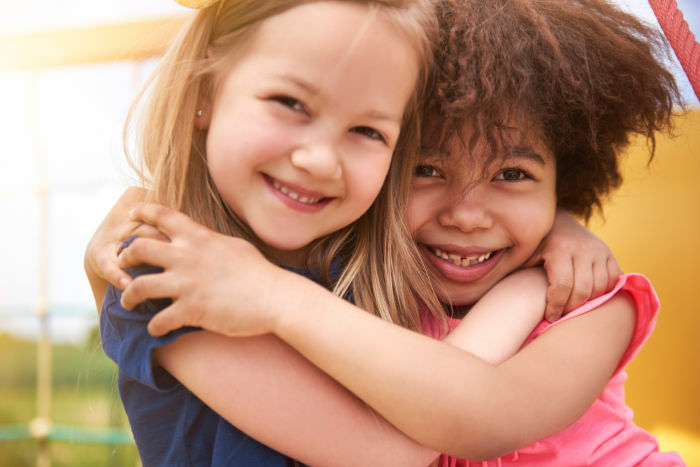 One of the keys to helping our children learn kindness is grounded in their ability to understand their emotions, feel a part of humanity, and practice self-compassion. Actively teaching our children to be kind to themselves first not only helps them show kindness to others, but fosters resilience and social-emotional wellness. Teach them how to use positive self-talk, and model talking positively about yourself: " I am a good friend. I am a loving parent." Help children feel a part of the larger world around them by participating in community events, especially those focused on a meaningful cause or social justice. Even while we encourage our children to be kind to themselves and others, they will still face adversity, social alienation, and disappointment. Helping children see these difficult situations as learning opportunities will build their frustration tolerance and "compassion quotient". When a challenging situation is behind you, talk with your child about it. Try to find the humor in your humanity. It is true that we often laugh one day about the things that frustrated us today. Teach children how to greet others with warmth and kindheartedness. Whether one is a president or a service worker, everyone is entitled to kindness and respect. And it turns out my mom was right! Acts of kindness have now been linked to emotion regulation (the ability to self-calm) and executive functioning (a range of skills that help us concentrate and problem solve), and can even help us sustain a peaceful disposition, combat depression and anxiety, and build deeper human connections. In the words of Lao Tzu, "Kindness in words creates confidence. Kindness in thinking creates profoundness. Kindness in giving creates love." May all of our children give and receive kindness throughout their lives.